Erin Brolly, one of our RYLA candidates visits us. 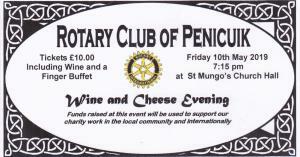 Rotary Club of Penicuik - welcome! Please scroll/swipe down through this page to find out more about us, in addition to the pages linked in the menu, top-left. 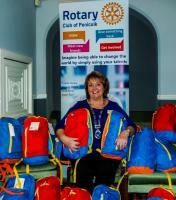 Members of the club and in some cases their families have provided 31 filled back packs for Mary's Meals. 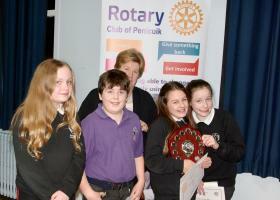 Strathesk Primary School wins the Club round of the Primary School Quiz. 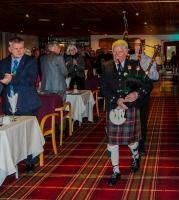 On 27th November, Stewart Houston from Biggar Rotary Club introduced us to Call my Bluff (in Scots). A very interesting night (but some dismal scores from the teams made up from our members). 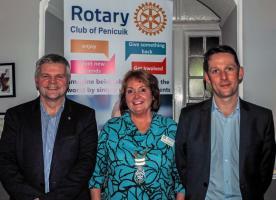 Welcome to our page - we are the Rotary Club of Penicuik, Midlothian, Scotland. 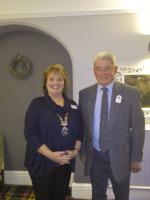 We are involved in many community and social activities, activities for children, young people, and the elderly; we provide financial and practical support to local primary schools and youth organisations, and disburse funds to national and international charitable causes including the Rotary Foundation of the United Kingdom.